To build buzz and eventually celebrate the release on June 30th, I'm inventing the world's FIRST Create-Your-Own-Contest Contest. 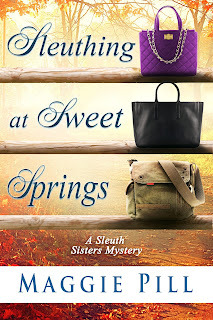 The rule is "Do whatever you want to with the idea of the Sleuth Sisters Mysteries, and you might win a $50-gift certificate to the bookstore of your choice." $50 worth of books? Be still, my heart! I'm guessing some of you will get all shy and say, "But I don't know what you want, Maggie." That's just it. I want what you want. However...here are some ideas that came to mind. Use them or ignore them and be creative. It's all up to you. Entries will be judged on originality, quality, and popularity, so have at it! *Caption the picture below (I'll post more in the days to come, so prepare to be inspired). *Take a picture of yourself reading one of my books. *Take a picture of yourself and your sisters being "familial". *Write an ode to your sister(s). *Write a nostalgia piece about growing up with sisters. Get the idea? Just do something really cool with my soon-to-be-four-book series. Put it into the comment section on my blog or email it to http://maggie.pill@yahoo.com and I'll handle it. Note: I will share what you do on Facebook unless I get thousands of entries, in which case I'll share some of them. Whatever name you sign at the bottom is what I'll share: for example, if you sign as "Mugwump" that's what I'll put on FB, so you're anonymous. If you don't mind having your full name shared, that's fine, too.